Facebook CEO Mark Zuckerberg said he doesn’t want to be the one making tough choices on what content should go on his platform. He told Recode he felt uncomfortable making calls “sitting here in California” that affect the whole world. Zuckerberg said he wants to come up with “a process” rather than make decisions himself. Mark Zuckerberg has said that he is “fundamentally uncomfortable” being the arbiter of hate speech on Facebook. “A lot of the most sensitive issues that we faced today are conflicts between our real values, right? Freedom of speech and hate speech an offensive content. He added that he wished there could be “a process where we could more accurately reflect the values of the community in different places.” Facebook has more than 60 outposts in the Americas, Europe, Asia, and the Middle East. 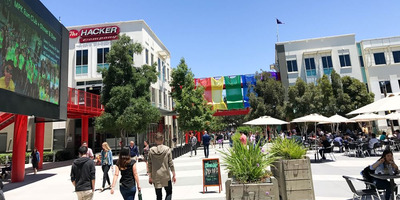 Glassdoor/FacebookFacebook’s HQ in Menlo Park, California. Facebook has been accused around the world of helping spread hate speech on its platform, has taken some steps to take to mitigate that image. The company has a Community Standards page outlining what it considers hate speech, but has often taken a long time to penalise users who appear to break the rules. However, some fan pages remain on Facebook, and the group’s leaders still have accounts on Facebook-owned Instagram. Facebook has been in crisis since Britain’s Observer newspaper found that data analytics company Cambridge Analytica secretively collected and retained 50 million Facebook users’ personal data for political purposes. Zuckerberg: You know, what I would really like to do is find a way to get our policies set in the way that reflects the values of the community, so I’m not the one making those decisions. Right? I feel fundamentally uncomfortable sitting here in California at an office, making content policy decisions for people around the world. Zuckerberg: I have to, because [I lead Facebook], but I’d rather not. Swisher: I’m going to push back on that, because values are what we argue about. And companies have values, and they have, you know, the New York Times has a set of values that they won’t cross and they make decisions. Why are you so uncomfortable making those value decisions? You run the platform. It is more than just a benign platform that is neutral. It just isn’t. I don’t know, we can disagree on that, we obviously disagree on this. But, why are you uncomfortable doing that? Zuckerberg: Well, I just want to make the decisions as well as possible, and I think that there is likely a better process, which I haven’t figured out yet. So, for now, it’s my job, right? And I am responsible for it. But I just wish that there were a way… a process where we could more accurately reflect the values of the community in different places. And then in the community standards, have that be more dynamic in different places. But I haven’t figured it out yet. So, I’m just giving this as an example of attention that we debate internally, but clearly until we come up with a reasonable way to do that, that is our job, and I do well in that.